Give us Feedback on our Recommended Charters. Send us a report on your trip! Was the charter good? Was it bad? What was good? What was bad? How were the mates? Did you catch fish? Would you use them again? Would you recommend this boat to other HRFA Members? Capt. Akira uses the resources of True World Tackle and True World Boats to give you one great experience on the water. NY State Inland Striped Bass Record Holder 54Lbs! Captain James Ace Samia has been operating ACE CHARTERS for over 13 years. He is licensed by the U.S. Coast Guard obtaining an OUPV near coastal up to 100 miles offshore. Ace brings over 30 years of angling experience both fresh and saltwater to the table. 2009 Baha cruiser 28 ft 9'6" beam with enclosed head. 400.00 half day (5 hrs) and 600.00 full day which are now 8hr plus trips. Striped bass - Hudson River south of the Troy Dam. Boat leaves from Coeymans Landing. Call for directions. �Great for Families�. Call for details. Lake Ontario, Oswego, New York: King Salmon, Coho Salmon, Lake Trout, Brown Trout and Steelhead. Weekday & weekend packages available, including lodging. Call for details. 10% Discount for HRFA Members! 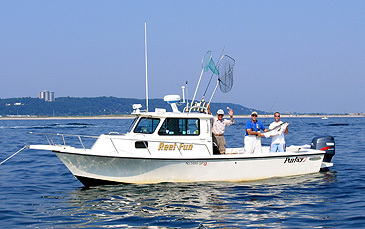 Reel Fun Sportfishing Charters fishes the waters of Sandy Hook, NJ and all the surrounding bays, rivers and the Atlantic Ocean in Monmouth County, New Jersey. both of which are United States Coast Guard inspected and licensed fishing boats which sail daily as open/charter boats for either day or night fishing. 10% Discount on Weekends for HRFA Members! Joe McBride is one of Montauk's finest charter boat captains. He has a 41 foot Hatterous and fishes inshore, and offshore , and canyon runs. Tuna is a specialty of his.An environmental protector, he will talk about the inequities of fishing and over fishing your entire trip. Many members of the HRFA have chartered with Captain Joe. Reserve early with this boat as he books up for the year quickly. The JOEY K Guide service is to help the shoreline angler catch the salmon of a lifetime. Joey shows you the ropes as far as tackle, baits, locations and techniques. Joe will be constantly yelling at you to "Get Down Stream!!!" Joe will wade with you and get you to all the hot spots. Coho and king salmon are his specialties. From late August until late in October the 30 and 40 pounders come into the Salmon river and only the experienced ones get to land their limits. Joey K will have you with those elite anglers. Call Joey at 315-387-3276 for the current season rates. You might just catch him on the river on his cell phone at 908-419-0138. You will have a good time with this guide. They offer a convenient bed and breakfast which will only cost you $25.00 a day which includes a generous and hearty breakfast. Bill and Pat Hiltebeitel run the place. For breakfast try one of Bill's Manhole Covers and let me know what you think. The rooms are clean and comfortable. Not the lap of luxury but they'd throw most of us out of a fancy hotel anyway. Too many fish guts hanging off us! This place will do just fine and for $25 bucks, you can't beat it. Is this a great looking spot or what? Cabo Fishing Pros offers visitors the premier Cabo San Lucas fishing experience with direct access to some of the richest fishing grounds in the world. All our boats have the latest sport fishing and marine technology, are outfitted with world-class fishing tackle and gear, and most importantly have the most knowledgeable and experienced captains. Click on our links and look at our world class operation! These guys have a great organization. They will make your trip as easy and trouble free as possible. Book right on line. All boats come with radios and life jackets. This on-line sight gives you everything you need to book your trip including choice of boats and captains (with qualifications), along with rates and fishing reports. Their office is right on the marina and will have coffee and lunch waiting for you. You can also book your trip with Pisces from home using your credit card. This is more convenient than using or carrying cash. You can pay for it in full at the time of booking or just put a deposit and pay the balance when you get there. Using your credit card also insures the best exchange rate as the card companies get the best rates. Much better than the locals give you when you are down there. The Best Sport Fishing Experience You'll find in Costa Rica! This has to be one of the best places in the world for Sailfish. March of 2004 HRFA members Chas Stamm, Nick Mennona, Joe Curvino and Ken Carson made the trip down to the Golfito Sailfish Ranch. The place is set up just for fishermen. This is on the west coast of Costa Rica in the southern section of the country on the boarder of Panama. We were targeting sailfish on this trip but I was also looking for some good action with Roosterfish as well. We took a flight to Miami, then to San Jose Costa Rica, stayed overnight in the capital city and then a 6 am flight out to the Pacific coast of the country, very close to the Panama border. From there we took an hour bus ride and then a boat to the lodge. Quite an adventure already!! This was not an easy place to get to! The fishing at the lodge did not disappoint us at all. I guess we raised an average of 10 to 15 sailfish per day. Per boat. We fished two to a boat in new 27 foot Ocean Master Boats. All boats at this lodge were 27 foot Ocean Masters. All meals, drinks and booze were included. Shown at the left is Nick releasing a nice looking sail. In Raising sailfish, what you do is troll lures without hooks in them. When a billfish comes up behind one of the lures, you tease him closer to the back of the boat, lift the lure out of the water and throw him either a fly or a live sardine. When he takes the bait, you hang on! What an exhilarating experience. Fifteen times a day! I guess we averaged getting in the boat and releasing 2 to 4 sailfish per day for each angler. Roosterfish up to 25 pounds, Spanish mackerel, Dorado, pompano and a host of other fish made this a very special adventure. The sailfish were outstanding. Joe used his fly rods for the most part and I used conventional gear of a Calcutta 400 and a triggerstick to bring them in. Same stuff I use for the Stripers in the Hudson only these fish were all between 80 and 120 pounds. If you want Tarpon, you go to the east coast of Costa Rica. If you want sailfish, you want the west coast. The only down side of the place is that the rooms had no air conditioning. That was not a big issue as the tropical breeze was always present. Still, when you came in from a long hot day on the water, it would have been nice to collapse on a bed in a nice cool air conditioned room. Guess I'm getting spoiled. Crocodile Bay across the Bay has Air Conditioning! The views from all the rooms give a breathtaking view of the Gulf every evening. Absolutely a magical place. I would still go back to this place...even without the air conditioning. The fishing was that good. But...I might try Crocodile Bay the next time.